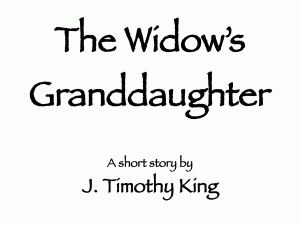 “The Widow’s Granddaughter,” an original short story (about 12,000 words), now released as a free eBook. Marietta is a pretty, young woman who has had one bad relationship after another, starting with her parents. Fortunately, they were gone for most of her life. She grew up living with her grandparents. Having returned home, she now finds her life taking a turn for the better, after she seduces a man as a bribe to help her grandmother. Since this is my own book, I’m not reviewing it. But if you read it, please post a comment below, or on Smashwords or on Lulu. P.S. Additional eBook formats are available in the Smashwords edition.